What Kind of "Hobby" is Fishing / Mutilation and Asphyxiation? 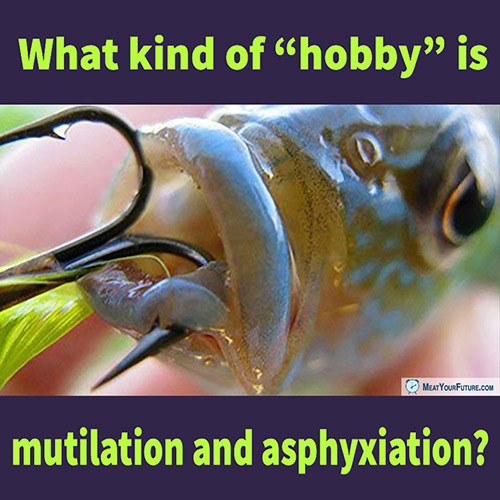 What Kind of “Hobby” is Mutilation and Asphyxiation? Like so many other things many of us grew up with, fishing seems perfectly normal, even peaceful, until we step back and actually think about it. There is nothing “peaceful” about tricking and stabbing a sentient animal in the mouth and face, dragging them by that wound out of the water, where they either asphyxiate to death or are thrown back injured and traumatized. Think about it. It’s a “hobby” where we mutilate, traumatize and asphyxiate a sentient animal. Even “catch and release” is terrifying for the animal, injuring them and making it less likely for them to survive. And, using the fish for food is not a good justification either, as we have exactly zero biological need to eat any fishes or other animal foods for our health. Fishes in particular are often highly contaminated with mercury, PCBs and other unhealthy substances. They are far from a “health food” and are certainly something we can live perfectly well without. And if you don’t go fishing yourself, but you still consume fish meat, that’s no less harmful. Marine animal populations are being decimated at an alarming rate. Experts from the UN FAO have reported that close to 90% of fish species are already fully fished or over-exploited, and many experts (including scientists from Dalhousie University) predict that, if current trends continue, we will see virtually fishless oceans in a few short decades. Please step back and consider what we owe to other sentient animals and to the environment, and, if you haven’t already, please go vegan.